630 Yates Street was built in 1950 by architect William F. Gardiner (1884-1951) for the Bank of Toronto, which used it as its main downtown Victoria branch office. The Bank of Toronto logo is still visible above the main door. This building was listed on the Canadian Register of Historic Places in 2008. When the Bank of Toronto merged with the Dominion Bank to form the present day Toronto Dominion Bank (TD Bank), this building became a downtown Victoria branch of the TD Bank. The bank branch was closed in the 1980’s as Canadian banks consolidated branch operations. Canadian Register of Historic Places – listed in 2008. 630 Yates Street was built in 1950 by Vancouver based architect William F. Gardiner (1884-1951) for the Bank of Toronto, which used the building its main downtown Victoria branch. The Bank of Toronto logo still appears above the main door. When the Bank of Toronto merged with the Dominion Bank in 1955 to form the Toronto Dominion Bank, this building became the main downtown branch of the TD Bank. It was a TD Bank branch until the 1970’s. Since the TD Bank moved out of the building, it has been home to a variety of businesses, including a glass blowing studio. 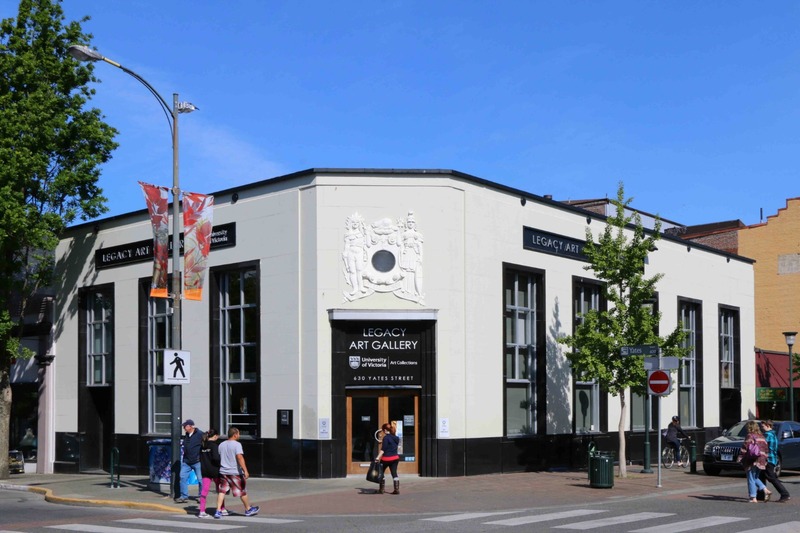 It is now run by the University of Victoria as the Legacy Art Gallery. The Bank of Toronto had been operating a branch at this site before this building was built. Here is a photo of the previous Bank of Toronto building, circa 1949.